As soon as anyone mentions Greek food, especially something like a juicy pork souvlaki recipe, I can almost taste the oregano and lemons. The famous combination of olive oil, lemon, garlic and fresh oregano form the foundation to that unmistakable flavor associated with Mediteranean food. 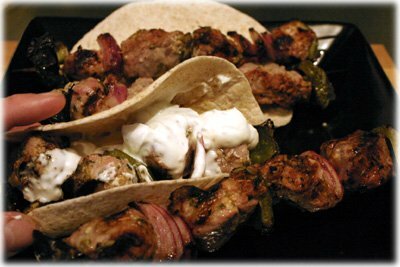 With this souvlaki recipe you grill the marinated pork, red onion and green peppers on skewers and then slide them off into a nice warm pita or tortilla shell and drizzle with a light, cool Tzatziki sauce. If you can't find Tzatziki in your grocery store try this homemade creamy garlic cucumber sauce instead. Eat these just like fajitas and serve them with a side of warm rich pilaf and a cold greek salad. I prefer the tortilla shells over the pita as there's less bread involved and the filling isn't overwhelmed. Slice the pork tenderloins into 1 inch chunks. 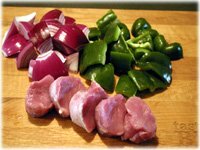 Cut the red onion and green pepper into chunks and set aside. 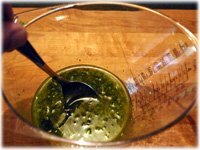 In a small bowl combine the marinade ingredients and stir well to ensure the oil, vinegar and lemon juice blend together. 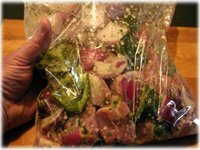 Place the sliced pork, red onion and green pepper in a resealable plastic bag and pour in the marinade. Mix the innards around well so everything is well coated in marinade and place the bag in the refrigerator for at least 4 hours. If possible leave it overnight for maximum flavor. 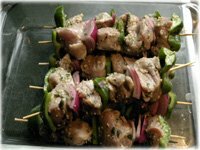 Begin threading the marinated green pepper, pork and red onion on skewers starting with the green pepper and alternating with pork and red onion. Preheat the grill to 425F - 450F and oil the grates well. 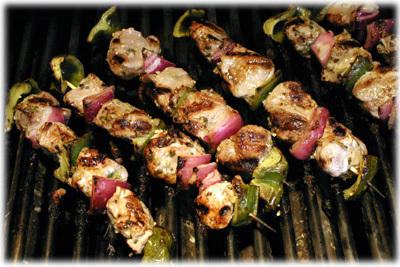 Once the grill has reached cooking temperature place the pork souvlaki skewers on the oiled grates and close the lid. After several minutes wiggle the skewers to loosen them from the grate and turn them 1/4 turn, they should be showing nice grill marks. Continue to cook the pork skewers and every several minutes rotate them another 1/4 turn so all sides cook evenly like the picture below. 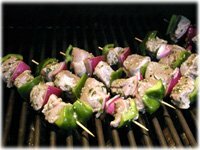 Once the skewers are cooked and pork is about 150F internal temperature remove the souvlaki from the grill. Place some grilled pork, onion and pepper in a warm tortilla shell or pita and drizzle with cool tzatziki sauce or this creamy cucumber sauce and serve.